• Antique blue silk (floral print with dots) dress set. 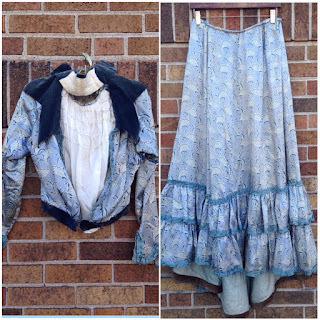 • Two piece: top (with seperate neck piece) and long bustle skirt. • Blue silk ruffled trim at cuffs and down front. • Cute zig zag cut at sleeve cuffs. • Dark blue velvet detail at each collar and band around waist. • Very cropped in length. • Front white ruffled silk under shirt layer exposed at front. 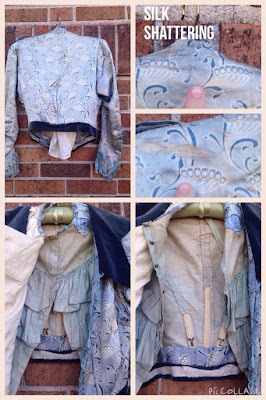 • Hidden hook and eye closures up front of blouse. • Handle still intact at back of skirt / used to hold skirt up. • Shorter length at front of skirt (bustle style skirt). 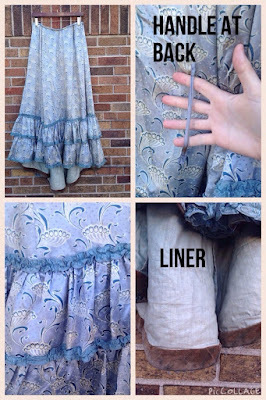 • Very full skirt (bustle style skirt). There are twointerior layers to the top. So I gave two measurement options because if you do not hook the front velvet waist sash together it gives more room but the top was meant to be hooked, which would make it incredibly tiny. Please let me know if I need to clarify. Length at front- 36 1/2"
AS IS: Please keep in mind this dress set is over 100 years old and was once worn. 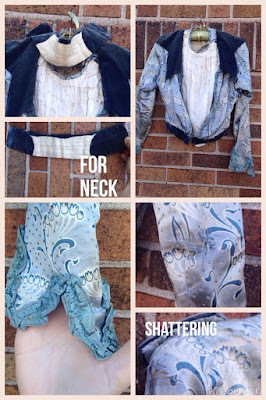 The silk is shattered at the blouse; on the shoulders, at back neck, and sleeves. A few hook / eyes are missing. The skirt is in good condition with the exception of a portion of bottom hem missing decorative trim. Minor stains to the dress set.